The relief you need to get through your day! The #1 Doctor Recommended artificial tear, Systane Lubricant Eye Drops has been clinically proven to reduce both the signs and symptoms of dry eye. Providing immediate, long-lasting moisture and protection, it's no wonder that Systane is preferred nearly 2 to 12 over other dry eye drops on the market. Available in 30 mL bottles, Systane Lubricant Eye Drops offers the relief you need to get through your day! Best dry eye lubricant that I've found! Relieves Discomfort. No Side Effects. Nurse. Chronic Dry Eye Sufferer. Medical Professional. 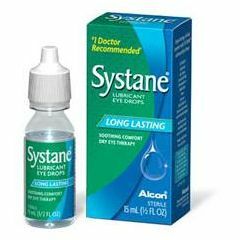 Systane is the best eye lubricant drop I've used. It is longer lasting than Natural Tears. It doesn't matte your eyelashes together like some of the other products that are advertised to be long lasting. Is this item sulfur free? Are there any eye drops that area? My mom is allergic to eggs and medications with sulfur, not sure if there is sulfur in the eye drops if it is considered the same thing. Is this product preservative free? Does it come in individual plastic twist off tops? Answered on Nov 21, 2013 6:57:08 AM by kmack from n.y.